Dan Morrow, a professor and the head of educational psychology, will speak at the next Beckman Institute Director's Seminar at noon, Thursday, Nov. 8, in Room 1005. Morrow will discuss “Health Literacy as a Resource for Older Adults' Self-care: Implications for Technology Design.” Lunch is provided. 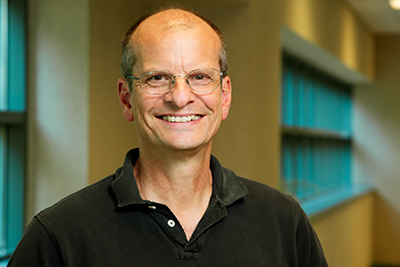 Dan Morrow, a professor and the head of educational psychology, will speak at the next Beckman Institute Director's Seminar at noon, Thursday, Nov. 8, in Room 1005. Abstract: Health literacy is vital for older adults’ self-care. We analyze health literacy as a multifaceted patient resource that depends on the interplay of broader cognitive resources that tend to decline with age (processing capacity) and resources that may increase (general and domain-specific knowledge; emotional self-regulation). Age-related strengths (knowledge and emotion) may offset cognitive limits to support older adults’ ability to understand and use self-care information. Guided by this framework, we explore how to design technology that supports self-care by reducing demands on age-vulnerable resources (processing capacity) and leveraging older adults’ strengths. I will illustrate by describing recent work on using computer agents for patient education and engagement in patient portals to electronic health records and other digital environments. Dan Morrow is a professor and the chair of the Department of Educational Psychology at the University of Illinois at Urbana-Champaign, with appointments in the Beckman Institute, the Carle Illinois College of Medicine, Illinois Informatics Institute, and the Departments of Psychology and Industrial and Enterprise Systems Engineering. He earned a Ph.D. in cognitive psychology from the University of California, Berkeley. His research on the impact of aging on cognition, communication and decision making in the health care and aviation domains has been funded by the National Institutes of Health and NASA’s Ames Research Center. He is the editor of the Journal of Experimental Psychology: Applied, past president of the American Psychological Association Division 21 (Applied Experimental and Engineering Psychology), and a fellow of APA and the Human Factors and Ergonomics Society. He has served on advisory committees for the Food and Drug Administration and the U.S. Pharmacopeial Convention.